Marcus J. Salter serves on the Program Services Committee. Marcus works for Community Mediation Services of Central Ohio as a Housing Stability Specialist. 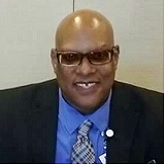 He attended Central State University and has extensive experience in Relapse Prevention, Conflict Resolution, Homeless Prevention ,Counseling, and is Certified by the Ohio Chemical Dependency Professionals Board in screening and assessment of dual diagnosed clients.